For all the surprises this World Cup has offered up, from Algeria being awesome to Italy and England apparently missing the plane to Brazil in the first place, the final matchup shouldn’t come as much of shock. Germany and Argentina were two of the pre-tournament favorites. Once Spain collapsed in the group stages, Argentina’s side of the bracket was always its to lose. It didn’t exactly dominate in the knockout stage (scoring a grand total of two goals in three matches) but it cracked opponents when it mattered, remaining incredibly stingy on defense. Across the bracket, Germany, after some seriously nerve-racking moments against Algeria, thoroughly put the clamps on France and then, well we all know what it did to Brazil. That’s how they got here. Here’s how they match up with each other. Messi still sees the ball toward the right side, but those advanced touches — just off the right of center, where Messi can turn and run at the back line — dry up. They’re replaced by deeper touches straddling the halfway line (though it’s important to note that the majority of those minutes came against a Netherlands team specifically trying to keep Messi away from the danger area). Messi can do a miraculous amount of things on a soccer field, but even he can’t drop deep, receive a pass, and then drop a perfectly weighted pass to himself as he glides into a dangerous position. Not yet, at least. That doesn’t mean there isn’t potential for no. 10 to leave his mark on this final. While the Netherlands effectively shackled him, it had a midfielder man-marking him the entire game. The whole point was to not leave the dangerous Messi zone empty. Germany’s midfield duo of Sami Khedira and Bastian Schweinsteiger are fantastic, but much of their skill comes from their athleticism. As was readily apparent against Brazil, they are fierce pressers who can create turnovers deep in an opponent’s territory while also streaming forward to support an attack. If Germany deploys them that way, the team risks leaving space in behind for Messi to do Messi things. Germany will probably play a high defensive line, with defenders asked to step forward and meet Messi as he’s receiving the pass, so that he doesn’t have time to turn and run. It’s a style Germany is comfortable with, but it places a lot of pressure on Mats Hummels and Jérôme Boateng to get things right at the point of attack. Javier Mascherano, who’s had a massive tournament in his defensive midfield role, won’t be asked to shut down any particular attacker, as he did rather effectively against Arjen Robben in the semifinals. Instead he’ll need to anticipate which of any one of a number of dangerous areas Germany’s attacks will come from. 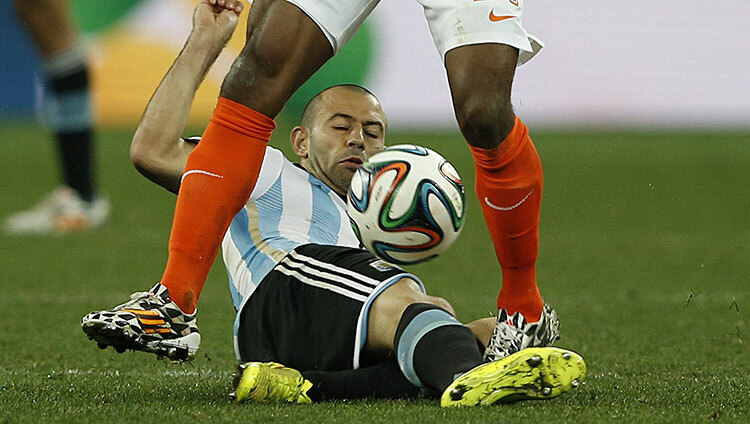 Against the Dutch, Mascherano’s task was relatively straightforward, if physically demanding. Against Germany, figuring out where to be will be half the battle. The German attack is all about movement. When it’s flowing, it uses spacing and interchanges players better than any other team in the world. So much movement. Thomas Müller is one of the best in the world at twisting left backs and defensive midfielders around as they try to track his runs or keep the defensive line intact. If a defensive midfielder tracks Müller’s run, it opens up space for Schweinsteiger and Khedira. If a full-back gets sucked inside following Müller, that opens up an entire side of the field for Philipp Lahm to attack. If the defensive line sags that means Miroslav Klose is lurking. Mesut Özil offers a similar, though somewhat less goal-oriented threat from the other side. With all of that to worry about, is it any wonder that as the defense sags and collapses and scrambles to recover, Toni Kroos so often finds himself sitting at the top of the penalty area utterly unmarked as the ball skips to his feet? Defending against all of that isn’t on Mascherano. Argentina’s full-backs are extremely conservative, and he consistently has a midfield partner to help shield the back line. Mascherano’s job is to stop Germany’s attacks at the point of origin, to make the tackle or interception, or even just be in the right position to stop a pass from being played as the ball begins to enter Argentina’s final third. The best way to stop Germany’s multifaceted attack is to shut it down before it gets rolling, and that’s Mascherano’s specialty. It may seem unfair to pin Argentina’s hopes solely on two players while highlighting the way Germany work as a team, but that’s the way these two finalists are built. Argentina coach Alejandro Sabella has constructed a team that depends on its two stars to shine; the rest of the squad know their roles. Joachim Löw gives responsibility to a wider array of players. There are more ways for Germany to shine, and more ways for it to fail. Argentina has Messi and Mascherano. After Sunday, one of these teams will have the World Cup. Four years and it has all come down to that.